Invitations: Your clients will be delighted to RSVP when they receive one of these invitations. With one of our ultra-luxe invites in smooth, quality card, they’ll know there’s a special event in store. For the ultimate attention to detail, we can personalise your invitations with your customers’ names. Our Invitations, Event Tickets and Postcards are printed on heavy 300gsm gloss card. Invitations: Your clients will be delighted to RSVP when they receive one of these invitations. With one of our ultra-luxe invites in smooth, quality card, they’ll know there’s a special event in store. For the ultimate attention to detail, we can personalise your invitations with your customers’ names. 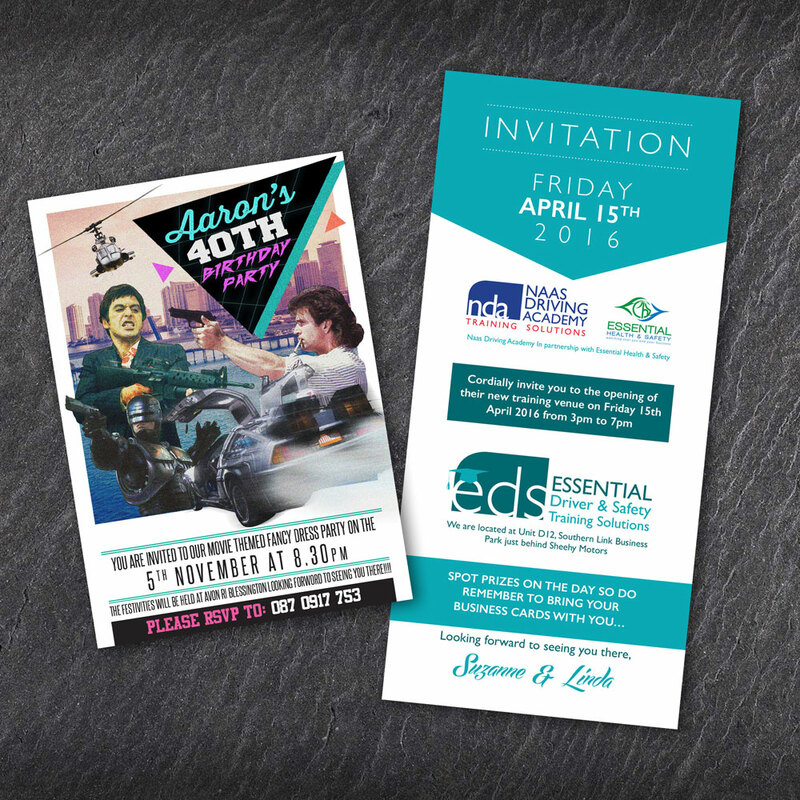 Our Invitations, Event Tickets and Postcards are printed on heavy 300gsm gloss card.Detail is everything when you want to create a good impression, so use our special service to round the corners of your invitations and showcase your design with our most luxurious card. Everyone’s going to want to come to your party. Tickets: Make tickets for your event as sought-after as the golden ones in Willy Wonka! We spend time on your design to ensure it conveys just the impression you want, creating tickets of such quality and high-end appeal that your customers will be fighting over them. Never mind—they are super strong and extra smooth for added durability. To make life simpler for you, we can insert an easy-tear line for you, or simply number the tickets. It’s your party, so you decide.Postcards: “We saw this and thought of you.” Tell your customers you are thinking of them with a quality postcard designed by you. A straightforward, inexpensive way to announce promotions and new products, our double-sided postcards on heavy 300gsm card are perfect for any announcement. Even better, you get to say what you want, reinforcing your brand and sending a message to your customers that really will make them wish you were here.